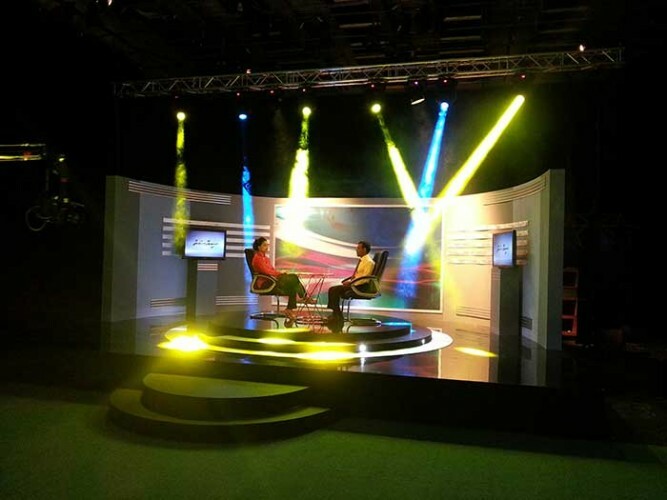 Premium fixtures from PR Lighting have been used on a key Maldivian political programme televised by local broadcaster, TVM (Television Maldives). Siyaasath was a one-on-one prime time interview session conducted by presenter, Liza Laurella, with the four candidates representing the major political parties: MDP (Maldivian Democratic Party), PPM (Progress Party of Maldives), JP (Jumhooree Party) and Dr. Waheed (an Independent Candidate). Part of MBC (Maldives Broadcasting Corporation). TVM sourced quantities of XLED 1037 and XR-300 Beam from local events company, Azidon Pvt,and these were designed into the stage set by Abdulla Shamin. Both fixtures packed more than enough power and features. The super-bright XLED 1037 has proven to be a popular addition to PR Lighting’s XLED moving head portfolio. Characterised by the use of 37 ten Watt RGBW LEDs (containing four colours in one), an outstanding feature is its wide linear zoom, with beam angle ranging from 12° to 54° — making it ideal for applications such as this. The XR 300 is an innovative Beam light with 300W Platinum 15R lamp and convex lens, with an incredible output of 85,579 lux at 20 metres.